Homemade Chex mix is something I’ve traditionally reserved for the holidays, making big batches in the oven and wrapping portions up as gifts for family and friends. But when I stumbled across a Chex mix recipe that utilized a slow cooker, I started wondering if my favorite tried and true recipe could be adapted to be made in my crockpot — and so I got to work. Being diehard Ohio State Buckeyes fans, our Saturday afternoons are penciled in for watching college football from September through November, and somehow our garage has become the neighborhood game day hotspot (which I love!). We fill the fridge with beer and plop ourselves down in front of our 42-inch Sony Bravia that gets toted down from our bedroom each weekend. As the night wears on and the kids tucker out, we bring out the Margaritaville Frozen Concoction Maker and whip up margaritas and daiquiris to order. I figured this past Saturday was the perfect opportunity to test out my new slow cooker Chex mix recipe. Now granted it could have been the beer or other miscellaneous frozen alcoholic beverages, but it got rave reviews! In fact, the entire batch was gone before it even had a chance to completely cool. I’ve since tweaked the recipe a little more, and in my opinion, it’s even better. But don’t take my word for it — give it a try for yourself! Mix all three Chex cereals, Cheerios cereal, pretzel sticks, and mixed nuts in a 6-quart or larger slow cooker. Whisk together vegetable oil or butter, Worcestershire sauce, seasoned salt and garlic powder and pour over cereal mixture. Mix well. Cook uncovered on high for approximately 90 minutes, stirring frequently. Turn the slow cooker down to low and cook for an additional 20 minutes, again stirring frequently. What’s your favorite “I didn’t know you could make that in the slow cooker” recipe? I just found where you did indicate that your crockpot is a six quart! Thank you again! I am just getting back into the swing of things using a crockpot after almost 16 years of not using one! I recently purchased a three quart crockpot and wondered what is the size of yours’ and should I try to reduce any of the measurements for mine? Thank you for sharing this I am so anxious to try it! My mom use to make it for the holidays and it was always the best I ever had! Love this recipe! I always hated stirring on baking sheets. i have never had good luck with chex mix recipes I think because i didn’t stir enough. This is so much easier although it can’t just be ignored. So be ready to stir! I used olive oil as the fat but I reduced it to 3/4 cup. Worked great. This can also be made gluten/nut free. I also made my own Lawry’s to avoid tricalcium phosphate. 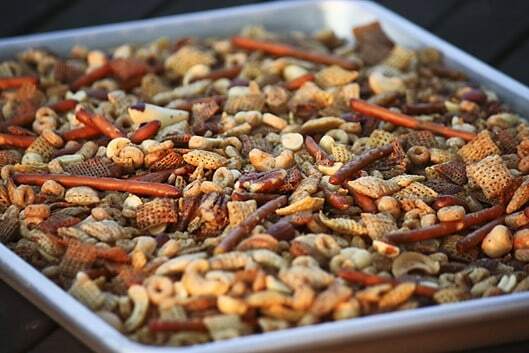 Chex mix in the crock pot sounds like a great idea. I’m going to make some for a get-together. Your recipe is almost the same as the original chex party mix except for the butter. The original calls for 6 tablespoons, and yours calls for 1 cup (2 sticks). That is a lot more. Why do you need so much more butter? Does it cook differently in the crockpot? Thanks for the information. Teena, this recipe is based on the one that my mom has always made for holidays. It does have quite a bit more dry components with the pretzels and Cheerios, so I’d imagine that’s the reason she always used so much more butter. Thank you for the information, sounds great. Try a little tobasco and cayenne pepper for a kick. And, Parmesan cheese (dried) added to the dry mix is very good but the cheese tends to burn and really needs attention, but yum! I’m going to try your recipe! Happy holidays. Thanks for sharing. LOL, looking forward to THE game Saturday! How long can this be stored and stay fresh?